When I worked at this chocolate cafe, we in the pastry kitchen were responsible for baking up all sorts of chocolate-intensive treats, as well as making the chocolate drinks that were the specialty of the house. From classic hot chocolate to mochas to bicerins, we made the mixes for the drinks in the kitchen, and they never seemed to last long enough before we’d have to make a new batch. I have to say that the smell of melting chocolate is one of my favorite memories from working there, along with the stream of regulars who would always gush happily about the spicy hot chocolate, or the chocolate thai ice tea, without which their day wouldn’t be complete. Sadly, I don’t have the metabolism anymore to consume a bowl of hot chocolate every day, or I’d be bigger than Augustus Gloop from Charlie and the Chocolate Factory. But every once in a while I’ll get a nostalgic craving for one of Bittersweet’s drinks. One of my favorite things to do in the early morning when I arrived for my shift, was to heat up one some of the chai-infused milk we used in the chocolate chai drink, as my sort-of morning tea. It was just spicy enough, and warm, which was nice in a kitchen not yet heated up from just-turned-on ovens. Even though I’ve used all the spices that make up chai before, a whiff of it never fails to make me think of the exotic. 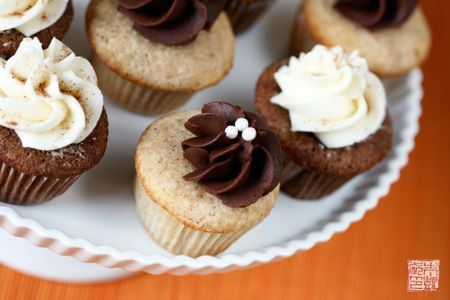 Memories of that chai is what inspired these chai cupcakes. Well, that and my attempts to pack up the kitchen for the impending move unearthed a mini cupcake tin I hadn’t even used yet, and a host of half-used spice jars. Yes, I know that spices lose their potency the longer you keep them around, and had I not been sternly warned by the boyfriend to stop buying more stuff when we’re trying to move, I might have gone out to get the fresh cloves and cardamom to grind myself. However, I’m still pleased with the flavor I achieved in these cupcakes: just lightly spicy, with a whiff of the exotic. While I combined ground spices to my liking, you can also get chai flavors in your cupcakes by infusing the milk with chai tea bags. I like being able to control the amounts of the various spices, and the intensity of the flavor. So in trying to decide what kind of chai cupcake to make, I went a little overboard. I couldn’t decide if I wanted a plain chai cupcake or a chocolate chai cupcake; in the end; indecision won out and I decided to make both – simply as a taste-testing experiment, of course. 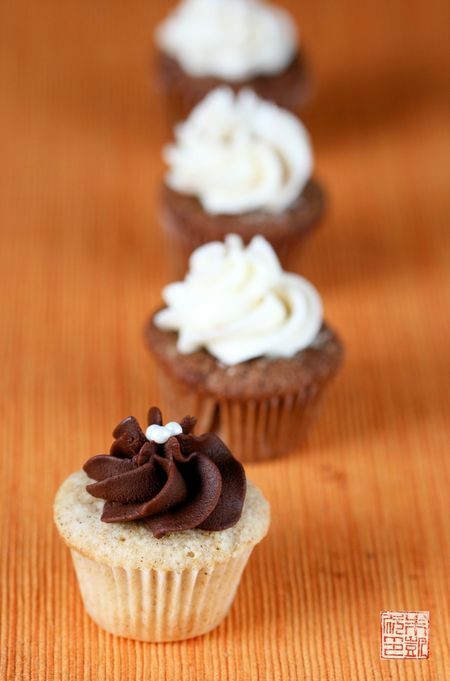 I used my basic vanilla and chocolate cupcake recipes, which baked up beautifully in miniature form. 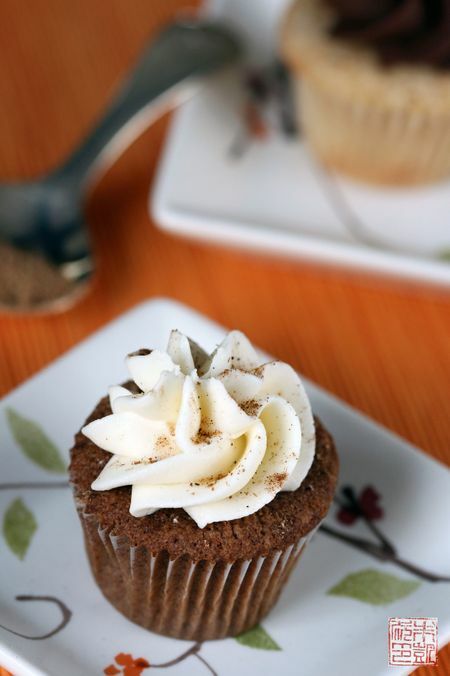 The vanilla chai cupcake is beguilingly freckled with the spices, and is pleasantly spicy, sort of like vanilla with a new dress on, while the chocolate version is richer, with a more smoldering flavor; I used more spices in the batter to boost the flavor. The question of what frosting to use arose as well: what started as a simple desire for cupcakes turned into a full-blown project as I settled on a cinnamon chocolate whipped ganache for the vanilla cupcakes, and a honey swiss meringue buttercream for the chocolate ones. These cupcakes have sugar and spice and everything nice packed into them! Maybe I went a little carried away with the cupcake experimentation, but the results were worth it – they make such nice visual contrasts to each other, don’t you think? A couple baking notes about the frostings: I’m becoming very fond of whipped ganache; it’s ridiculously simple to make and so addictive, especially if you use your favorite chocolate. Be sure to let it chill completely before whipping it, otherwise it might curdle (some recipes say you only need to let it cool to room temperature, however I had better results when I chilled mine). Also, don’t overwhip it; you’ll get the same unpleasant mess you do when you overwhip cream. However, what you can do with overwhipped ganache is to simply melt it over a bain-marie, let it set up again in the refrigerator, and rewhip – carefully. For the swiss meringue buttercream, I love it because it’s quicker to make than italian meringue, but it is less stable, so I’ve learned a few tips to making it: be sure to cook the egg white mixture to 160 degrees F, to make sure all the salmonella bacteria are killed; whip the meringue in the mixer until it’s fully cooled and thick, or else hot meringue will melt the added butter; your butter should be room temperature and softened to incorporate easier into the buttercream; and finally, many times the buttercream appears to curdle or break, which always sends people into a panic, but you simply have to keep beating the buttercream for several minutes and it will come back together into a nice velvety buttercream. So I guess baking a batch of cupcakes isn’t exactly packing up the kitchen, but at least we have something to snack on while we continue our moving-out endeavors! Sift the flour, baking powder, and salt together into a medium bowl. Stir in the chai spice mixture. Add in egg and egg whites, one at a time, beating thoroughly after each addition to combine before adding the next. Combine milk and vanilla in a measuring cup or small bowl. 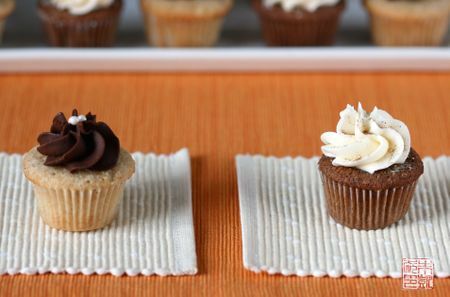 Using an ice cream scoop or a spoon, fill each cupcake liner about ¾ full with batter. Bake in oven for 15 to 18 minutes, rotating the pan halfway through, until a toothpick inserted in the cupcakes comes out clean. Mini cupcakes will take about 15 minutes, so check sooner. Place chocolate in a metal bowl and melt over a pot of simmering water. Set aside. Sift the flours, baking soda, and salt together into a medium bowl. Stir in the chai spice mixture. Cream the butter and both sugars together in a stand mixer with paddle attachment on medium speed until soft and creamy. Add in the chocolate and mix to combine. Add in eggs, one at a time, beating thoroughly after each addition to combine before adding the next. Add in the flour mixture and buttermilk in three alternating additions, starting and ending with the flour mixture. Beat just to combine each addition before adding the next. Combine the sugar, honey, and egg whites in a medium metal bowl and place over a pan of simmering water. Add in the vanilla extract and beat to combine. Combine cream and cinnamon in a medium saucepan and place over medium heat. Heat just until it comes to a simmer. Place ganache in a stand mixer and whip with whisk attachment until it is light and fluffy. Do not overwhip or it will become dry and crumbly, just like overwhipped cream. Very pretty, and I can only imagine how good these are! Okay, first of all, I’d like to have a tall glass of that chocolate thai iced tea right about now. It sounds amazing. 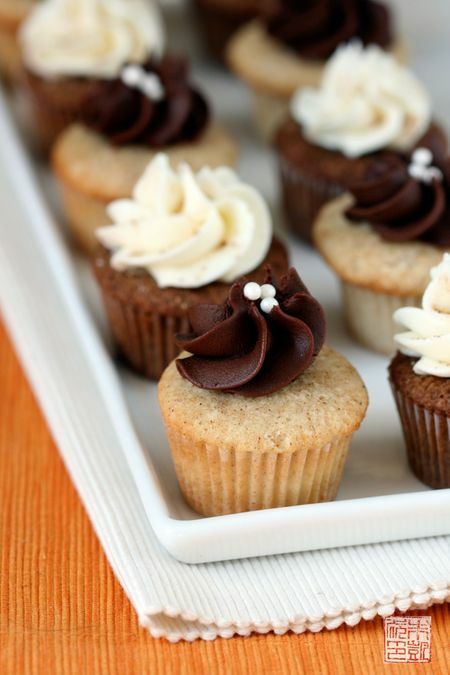 mmmm i’ve been thinking about making chai cupcakes for the cupcakes on my menu…these look fantastic anita! both version look so good! Anita, all your desserts look so amazing!!! All too often I found myself reading your blog and wanting to dash off to a pastry shop right away hahaha. Especially heart the Asian flavor inspired creations. Thanks for generously sharing the recipes and I hope I can try them out soon. Thank you so much for all the information and tips on frosting. Good luck with packing up. I tend to procrastinate such things as well… Plus, I get panicky at the idea of not being able to cook for a while. I just put my mini muffin tin to use for the first time too. Your muffins sound ( and look ) wonderful! I love the idea of making your own chai spice mixture. Hahaha! “Stop buying more stuff when we are trying to move” LOL we just moved and I heard THAT for quite awhile!!! These look outstanding. I love Chai. Can’t wait to give them a go! Both versions look delicious. I love the spices in chai tea so the cupcakes must be incredible. I like whipped ganache too- decadent taste but so simple to make! Thanks for sharing your recipes. I just came from the kitchen where I was making a chai granita and found your post about these lovely cupcakes! Beautiful! I love the visual contrast between the two and your choice of decoration. Looks great! Lovely looking mini cupcakes! Gorgeous pics! I know what you’re saying about the swiss meringue buttercream…the first time I tried it a threw away what my husband explained to me later was probably a perfectly good batch of chocolate buttercream if I had just had a little patience. Funny that you made these mini, as I made some chocolate chai spice cupcakes recently (http://syrupandhoney.typepad.com/blog/2009/05/chocolate-chai-spice-cupcakes.html) and my boss said these would be the perfect small bite because they are so bursting with flavor. Mmmmmmmmm. So cute… And I’m sure that so fragant too. I love spices and I’m completely sure I’d love these cupcakes too. I just have to make them now. anything chai is good in my book! They look absolutely gorgeous and so cute! The chocolate chai cupcake looks divine! Great recipe. Thank you from a fudge addict. Mmm, that looks delicious, I’ll have to give them a try! I had some whipped ganache split on me recently, which really made me feel like I’ve lost my mojo, but I just need to try again! I usually use fresh and easy organic egg whites for my swiss meringue buttercream since they are pasteurized I dont have to worry quite so much. I still heat them, but it gives me a little peace of mind. Absolutely gorgeous (as usual)…thank you for your inspiration! You seem to have great little cafe’s and such in San Francisco. Great looking cakes. By cake flour do you mean self-raising flour? The cupcakes look so beautiful and I love the chai element! I just might have to break down and bake something! When you say you can infuse the milk with tea bags, do you mean to just steep the tea bags in cold milk? Or would you heat the milk, steep the tea bags, then chill the mixture before using it to bake? Thanks, and love the contrast! I would do it similar to making tea – heat the milk to simmering, then place the tea bags in and let steep as long as desired to get the depth of flavor in the milk. I would let the milk cool before using it, but it’s not necessary to chill it. Good luck! I liked two small changes I made to the recipe for vanilla chai cupcake (though I am confused why the name has vanilla in it when there is no vanilla in the recipe). This made it come out very very light and added a nice taste. Reduced flour to 1 cup. replaced 1/2 cup milk with 2/5 cup milk + 1/10 cup kahlua. I am so making these bad boys today! They look delicious! Thanks so much for an awesome recipe. Thank you for this amazing recipe, they are DELICIOUS! I just made a small batch of this deliciousness… and WOW! My world will never be the same. I work in a cupcake cafe and still these cupcakes are amongst the best I’ve ever tasted! The buttercream took a bit of patience, but it was well worth it. I’d recommend making them in a mini muffin tin, as the frosting can be a bit rich for a full size cupcake. Thanks for this recipe! Thanks so much for the kind comment and I’m glad you liked them. You know, I can’t remember now if I left out the vanilla by mistake or it was a naming error. I’ll have to go back and retest, but thanks for bringing it to my attention!